Even as I walked out of my house Saturday morning, I was composing my narrative for the coming day’s events.Â How fortunate it was, I would write, that I didn’t spot the storied Smith’s Longspur holding court at Long Island’s Jones Beach State Park for the last month last time I sought it out. How serendipitous it was, I might add, that Charlie would come to town just as the season’s longspurs and buntings were shedding drab plumage for breeding brilliance. How sweet it is, we can surely all agree, to finally get a good look at one of the most interesting species of a most interesting season of New York winter rarities. But of course, that isn’t exactly how events played out. Is it ever? The day started out according to plan. Charlie, that tireless, international blogger of birds, finally found his way to my humble city. In discussing our abundance of options, we realized that neither of us had ever seen a Smith’s Longspur. A second effort to spot Calcarius pictus was in order. So I picked Charlie up and sped out to the beach. The weather was infinitely improved from my last trip to the Theodore Roosevelt Nature Center at Jones Beach, when Corey and I were assailed by an evil, arctic wind. This time, the modest breeze and mild cold made for much better birding. All the best birds from last time were in attendance too. 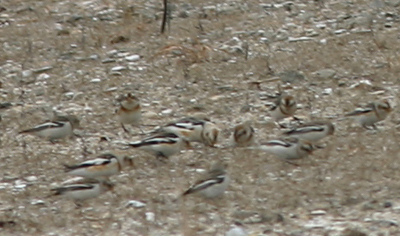 We had no problem picking up Snow Buntings, Horned Larks, Black-bellied Plovers, Northern Harriers, and even Lapland Longspurs. However, the Smith’s stayed out of sight of a considerable host of sentries. An hour or so of searching turned up only Song and Savannah Sparrows, so we stole away to the Coast Guard Station for a change of pace. Though we later heard reports of Razorbill in the inlet, we didn’t encounter any birds at the Coast Guard Station that I haven’t seen multiple times already this year, with the exception of a Northern Shoveler pair. Mallard, American Black Duck, Bufflehead, Red-breasted Merganser, Common Loon, and Horned Grebe were all par for the course, as were the usual winter geese and gulls. I should add that Charlie was quite taken with the gregarious gaggles of Brant, much as I might be when faced with species common elsewhere but uncommon for me. You can bet that he’ll be posting an excellent gallery of these wonderful waterfowl soon enough. On the way back, we noted an increasing diversity of passerines which included my first Field Sparrow and Red-breasted Nuthatch of the year.Â But these weren’t the birds we visited the seashore to see, so we made our way back to the nature center. On our arrival, we confronted a sight every twitcher dreads: every scope in the area relocated a quarter mile away, pointed towards an even more distant object. All the birders were concentrated (and clearly concentrating) on a corner of the beach’s boardwalk loop, an area Charlie and I had combed earlier. We rushed forward with as much dignity as we could muster, hoping beyond hope that someone still might have a fix on this elusive bird by the time we arrived. Instead, my worst fears, at least my worst birding fears, were realized when a bunch of indistinguishable brown birds sought cover in a tangled mess of reeds. We missed it! No one who knows me would describe me as a patient man. Far from it, I’m just not interested in waiting around for a bird, even a rare one. However, Charlie and I were committed to spotting the Smith’s, so we stuck around and scanned every incoming flock, even as other birders deployed to more potentially strategic vantage points. Massive flocks of seaducks, mostly White-winged Scoters, moved one by one from the western horizon to the east, but still we waited. Patience finally paid off when we observed eight or so small birds land in some distant scrub. Little brown jobs were scurrying around too far away to distinguish with binoculars, but when the birders next to us locked on with their scopes, we hit paydirt. Everyone else in the area came running and before long, we all had looks, unsatisfying though they were, at a longspur with a distinctive golden underbelly. Tick off that Smith’s Longspur! One day, presumably during my next visit to northern Canada or Alaska, I will get clearer, more leisurely looks at this lovely bird at the peak of its breeding plumage pulchritude. For now, I will embrace the adage that lousy looks are better than no looks at all. Having missed more than my share of birds this year, I’m quite pleased to have laid eyes on this prize. Another sighting that made me smile was a few Tree Swallows fluttering along the beach, a sure sign that spring migration is nigh. Congratulations on the lifer, Mike! I was wondering if you would give it another try, since it has stayed around so long. Nice…at least someone I know got to see it! It looks like you might have gotten it on its last day there too…a post on the state listserve says that not only was the Smith’s missed Sunday but that no Lapland Longspurs were observed either…let’s hope the Smith’s survives the rigors of migration and comes back next year! Oh man! Congrats! That’s one I’ll have to wait for another day to see. I missed it last weekend. I did get great looks at a Pac Loon yesterday for a state bird for me in NJ. Of course, it was spotted today (Monday)…maybe it’ll still be around when I come down again this weekend! Oh goody, another afternoon looking at a bunch of clumps of beach grass!